Roosters add some lovely color to this farm, especially in the the heart of winter. Tomorrow is Yule, and the darkest night of the year. But how could any of us be worried about the lack of sunlight when beasts such as this are strutting around right outside your front door? Seeing this little banty, with his boots and colorful jacket makes me warm inside, regardless of the daylight hours. I know not everyone out there keeps roosters that keeps a laying flock, but I find them a necessity to my own hens. A rooster keeps a free range flock calmer, as he is the one keeping watch and sounding alarms for things like skyward and land-locked predators. They greet each morning with they crows (which I adore) and make a delicious pot pie if things don't work out in the protection or musical departments. What are your thoughts on roosters? Do they add to your flock or annoy the neighbors? Are they banned by your local laws or do you have a dozen strutting around your ranch? What's the word on these birds?! Go roosters! They add such a nice dynamic to the flock around the yard. And you're right, why not have them when they can at least help make the dinner? Your posts are a nice December pick me up! Isn't is amazing how varied and in-depth a chicken's personality can be?! What amazing and complicated creatures! I would love to have a rooster or two, but my flock is already stealth. The roosters I've had had to go back to the place I got my girls. I had an accidental rooster with my last flock. I think I didn't have enough hens because the poor girls wound up with featherless backs after a short while. He grew up to be a monster of a bird. I swear he was 10 pounds when I gave the flock away.Nice enough in personality, but randy as mad. My only encounter with roosters was on my grandmother's farm. She had an aggressive rooster who would chase me (as a child) when I went out to put feed down. So no good memories there, but I do think, as you've all said, that it depends on the personality of the bird. I liked hearing them at dawn. And they are alert little buggers, aren't they? oops, duh, I meant my buff barred current roo was the omega of the bunch, low man of the pecking order. Love your blog, wish I lived closer, but whats the USDA zone there? Already in 5 and wouldn't want to go lower. Brrr. I wouldn't be without a rooster - or two, given enough space and hens to go around! Right now I have a Speckled Sussex and a Buff Orpington in residence. I love having the option of fertile eggs for hatching, I love hearing them crow, I love watching them strut around the barnyard, and I love how they take care of their ladies! 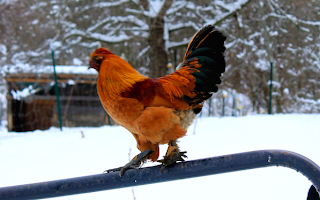 'Mister' Rooster widened and greatly enhanced my knowledge of chicken behaviors, accelerated and bolstered my skills and pushed my learning curves with chicken keeping. I will be forever grateful that he came into my life. I didn't want a rooster when I got my starter flock 15 months ago. I'd been flogged before while chicken sitting for friends and just didn't want to deal with the trouble they can cause when I was just starting out, didn't need one for 'protection' as mine are confined for several reasons and I had no plans to do any hatching....but....she swore he was non aggressive to people(and kinda proved it when I went to look at them) and if I took him with the 5 laying hens I wanted, I would get 4 four month olds thrown into the deal. This woman was splitting her flock because of her 2 roosters not getting along as well as to downsize to her most desired, she loved my just built coop and gave me a real deal to get me started out at $20 for 10 birds. He was a huge(Dk Brahma mix), gorgeous and great rooster from the get go. Climbed into one of the nests (just once) on the first day and talked quietly to the girls for an hour 'this is where to lay'(and they did), gently took food from my hand and dropped it for the girls, never challenged but was always inquisitive with me and had a wonderfully clear 3 beat crow. But he never schooled his son(one of the 4 four month olds and the spitting image of Mister) when Jr started harassing the hens and pullets. So Jr was segregated, bestowing immediate peace, and became rooster n noodles thus 'forcing' and fulfilling the meat harvesting portion of my chicken keeping goals. I have since hatched some couple dozen or so of Misters chicks along with fertile eggs from a friends flock and raised them along with other purchased chicks. I now have a gorgeous Welsummer cockerel who is shaping up to be another good rooster, Mister went back to the woman I bought him from to head up her sisters recently roosterless flock...not sure if he still lives on, and the other cockerels hatched were rehomed to folks who wanted/needed one or harvested to grace my plate. I am lucky that I live rural enough, where agricultural activity abounds and only one neighbor within 500 feet, that I can have them. Not sure poultry are actually 'allowed', don't think my township even has anything about roosters. I *know* they don't have an excessive noise ordinance-but that is another story. So (sorry for the novella), Yes Roosters Rock! They can be vicious PITA's, are delicious when grilled at under 16 weeks old, make awesome stock/stew if older and are vital to the 'birds for food' scenario. I can't stand it when people whine 'Ohh boohoo, what to do with the roosters' Livestock, Deadstock...Breed the Best, Eat the Rest! !....plus some of them are really beautiful to look at. "Bad Cockerels" would be a great rock band name. HI Jenna. I've been keeping chickens for about 6 years and along the way, have had 2 accidental roosters. The first one, my girls HATED. They beat him up and stripped all the feathers off of the back of his head/neck! (Yup, they were a tough flock) One day, he attacked me and tried to take my eye out. He came quite close to doing so, so he went to the butcher. The second one was huge and was a pain. He would break out the flock from their pen! He was also hated by the girls and like the first, got beat up-but this time to the point that the hens drew blood! Needless to say, he also went to the butcher. In both cases, these birds came from backyard producers who THOUGHT they were hens. Since then, I have ordered from hatcheries where they KNOW they are hens! I'm not real keen on the noise a rooster makes and my girls CLEARLY do not like have a male around-so we are all very happy being rooster free! I always keep a rooster, for several reasons; I enjoy the crowing, he protects the hens, sounding the alarm when anything the least bit suspicious is near, and I want obtain my chicks in a more natural way than by USPS. The problem is finding one that isn't aggressive toward me; I blame poor breeding practices at the modern hatcheries for this. My current man-bird Javier is a keeper though! I live in the middle of a city so no roos for me...but trust me, as soon as I get my own scrap of land it'll be straight run all the way. I love them! I just dispatched my first rooster, Napoleon, yesterday. He was a beautiful big Rhode Island Red cross who was just coming into his full manhood. Unfortunately, he was excessively aggressive with my hens. Last Tuesday, my chicken run looked like a crime scene... I gave it a few days to see if things would settle down, but when Napoleon tried to murder the Barred Rock hen, I was done. No more roosters for Sweetgrass Ranch! We don't have a rooster. I don't know if I want one. A friend of mine grew up on a farm with an mean rooster - when they left the house they had to carry hockey sticks to fend him off! I was attacked by a rooster when I was a small girl so I'm very cautious of them. He was a seriously mean little guy and would run after the little kids and jump on their shoulders and peck the crap out of them. He attacked me when I was putting down food; I had to go to the doctors. But it's now a very funny story to tell! I have a rooster named Franklin that is a complete gentleman! He always sounds the alarm and then is the first one into the barn! Splendid Solstice Blessings to you! We live in a rural area so no problems with the roosters. Always keep 1 or 2 for breeding & protecting the gals. I have raised many mail order chicks but being older and wiser would rather let a momma hen do it... she is far superior to me! What a handsome fellow you have there! Love his colors. The farm where I work had a roo named Red. He wasn't fond of women, and attacked me a few times, thankfully I was always in heavy boots and fended him off. It was only later than I found out from my boss I should have been rougher on him. I can handle a 2000 lb horse, but didn't know what to do with a 20 lb cocky roo! we have Hispanics that sometimes used to come and ask for live birds, and one day they asked about a roo, so my boss told them if they could catch him they could have him. Wouldn't you know it the one guy went right in and as soon as Red dove at him he snatched him up by his neck! He had obviously done it a time or two! The previous rooster on the farm was apparently nice, but Red got what was coming to him.